Discontinued products, many announced products which do not even appear on this page (we are in the middle of 2016, after all), and despite the fact that there is an ARM Server Base System Architecture (SBSA) specification, every vendor has its own installation procedure. It is still a somewhat chaotic scene. Meanwhile, Intel listened to their "hyperscaler customers" (Facebook, Google...) and delivered the Xeon D. We reviewed Intel's Broadwell SoC and we had to conclude that this was one of the best products that Intel made in years. It is set a new performance per watt standard and integrated a lot of I/O. The market agreed: Facebook's new web farms were built upon this new platform, ARM servers SoCs were only successful in the (low end) storage server world. To make matter worse, Intel expanded the Xeon D line with even higher performing 12 and 16 core models. But losing a battle does not mean you lose the war. 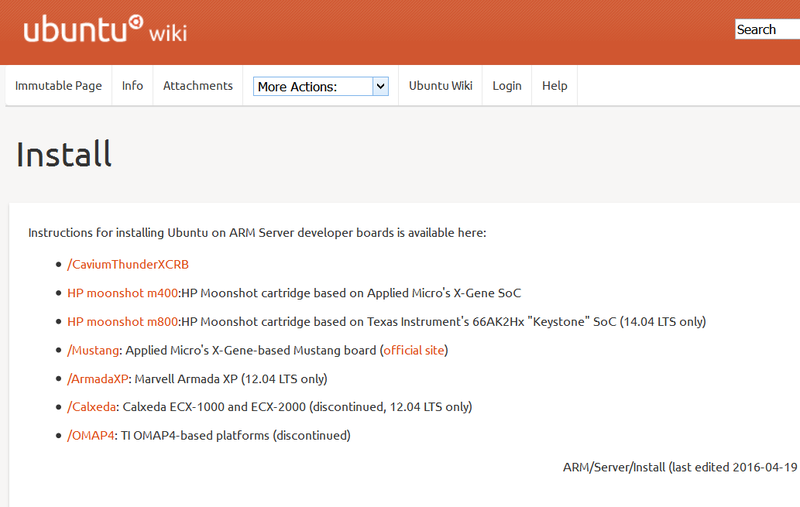 Finally, we have a working and available ARM server SoC which has more ambition than beating the old Atom C2000 SoC. In fact, Cavium's ThunderX SoC has been shipping since last year, but you need more than silicon to get a fully working server. Firmware and kernel need to get along, and most libraries need to be compiled with platform-specific optimizations. So the quality assurance teams had a lot of work to do before Cavium could ship a server that could actually run some server software in a production environment. But that work has finally been finished. 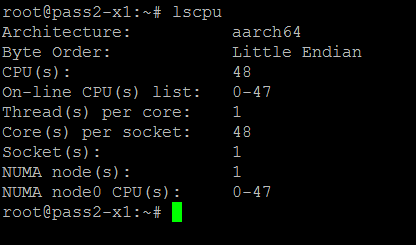 Cavium send us the Gigabyte R120-T30 running Ubuntu 14.04 server with a ThunderX ready Linux kernel (4.2.0) and ThunderX optimized tools (gcc 5.2.0 etc.). Who is Cavium anyway? Even for those working in the enterprise IT, it is not a well known semiconductor company. Still, Cavium has proven itself as fabless network/security/storage and video SoC designing company. The company based in San José counts IBM, Juniper, Qualcomm, Netgear, Cisco among its customers. With a net revenue of about $400 million, Cavium is about one-tenth the size of AMD. But then again, Cavium either reports small losses or smal profits despite heavy investments in the new ARMv8 project ThunderX. In other words, the company's financials look healthy. And Cavium did already design a 16-core MIPS64 Octeon Network Service Processor (NSP) back in 2006. So Cavium does have a lot of experience with high core count SoCs: the network processor Octeon III CN78xx has 48 of them. Handling server applications is of course very different from network processing. A large amount of independent network packets creates a lot of parallelism, and more complex computation can be offloaded to co-processors. 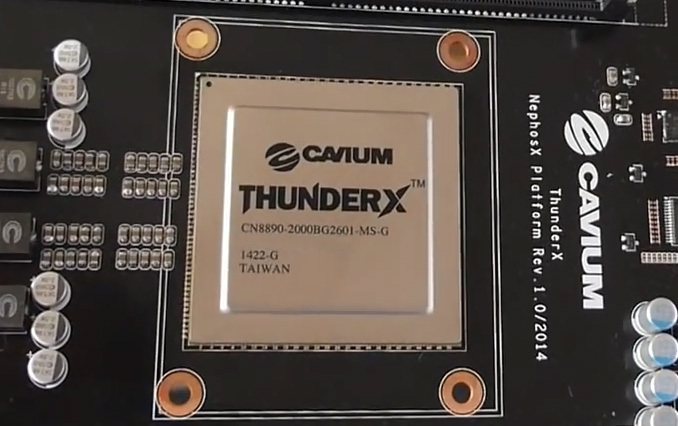 Still, Cavium is the first vendor that delivers an ARMv8 server chip with an impressive core count: no less than 48 cores can be found inside the ThunderX die. To keep the design effort reasonable, Cavium based their first ARMv8 server processor, ThunderX, on the Octeon III CN78xx. We described this in more detail here, but the main trade-off is that Cavium used a relatively simple dual issue core. As a result, single threaded performance is expected to be relatively low. On the opposite side of the coin however, it is the first ARM SoC that has claimed throughput numbers in the realm of the best Xeon D and even midrange Xeon E5, instead of competing with the Atom C2000. It is the most ambitious ARMv8 SoC that has made it into production.